Heat oven to 350°F (325°F for dark or nonstick pan). Line 9-inch square pan with foil, allowing some to hang over edges of pan. Grease bottom and sides of foil with shortening or cooking spray. Make and bake brownies as directed on box. Cool completely on cooling rack, about 1 1/2 hours. Freeze in pan 15 minutes. Using foil to lift, remove brownies from pan, and peel away foil. Cut into 4 rows by 4 rows. Decorate as directed below, using 5 or 6 brownies for each bowl of frosting. Franken-Brownies Add desired amount of green food color to frosting in 1 bowl; mix well. Top each of 6 brownies with 1 large marshmallow. Spoon 1 tablespoon green frosting over each marshmallow to coat. Decorate with green M&M's™ minis chocolate candies for eyes and ears. Use black gel for mouths and centers of eyes. Cut fruit snack to use for hair. 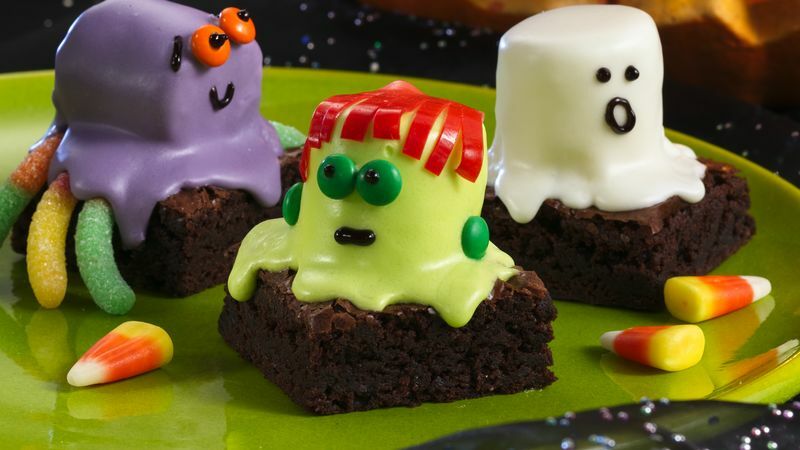 Boo-Brownies Top each of 5 brownies with 1 large marshmallow. Spoon 1 tablespoon white frosting over each marshmallow to coat. Use black gel for eyes and mouths. Spider Brownies Add desired amount of purple food color to frosting in 1 bowl; mix well. Top each of 5 brownies with 1 large marshmallow. Tuck gummy worms candies under each marshmallow for legs. Spoon 1 tablespoon purple frosting over each marshmallow to coat. Use orange M&M's™ minis chocolate candies for eyes. Use black gel for mouths, centers of eyes and eyebrows.